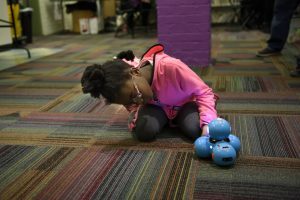 One of our partner libraries, the Niles District Library in southwestern Michigan, has recently been featured in an article about increasing use of libraries among millennials. The article from PBS Michiana reviews a Pew Center study about library usage. 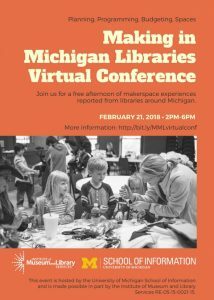 Staff from several Michigan and Indiana libraries. including the Niles District Library, were featured in an accompanying video. 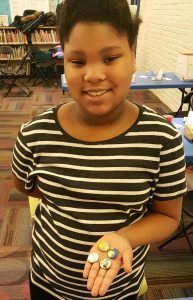 This semester, we’ve been holding weekly makerspace workshops at the Ypsilanti District Library. These events are for children of all ages and their parents. Each week has a different theme, and every week we are amazed at the creativity we see! Below is a summary of the last eight weeks of Michigan Makers at the Ypsilanti District Library. Week number one started with the foolproof activity of toy takeapart. 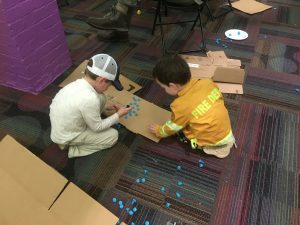 This was a fascinating activity to do with a wide range of ages–the younger children were going for quantity over quality, seeing how many toys they could take apart and finding the stuffing inside the toys as entertaining as the electronics and circuitry. Meanwhile, the older children were meticulous. 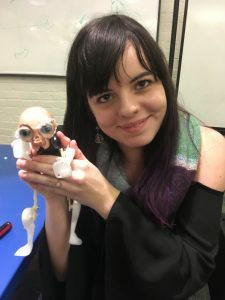 One older child was taking apart a toy cat–she would not consider opening up the electronic component until her cat had been stripped of all of its hair. Pictured below is one of our Michigan Makers grad students, Tori Culler, with that very same cat, reduced to its ‘skeleton.’ Notice the hodgepodge of colors and types of plastic making up the frame of this cat–an indication that this cat might be made up of recycled parts. Week number 2 was focused on sewing and knitting. It was amazing to see how these traditionally gendered activities were popular among all children! 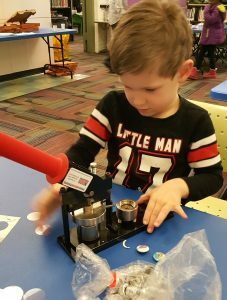 The Ypsilanti District Library had previously run sewing workshops for children, and they were thrilled to see the sewing machine again in particular. 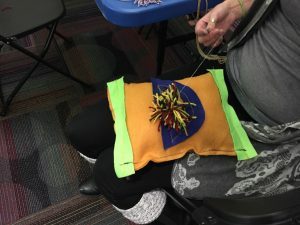 The activities that we officially had on tap were finger knitting, felt puppets, and yarn pom poms, but the kids used their imaginations to invent their own crafts. One child made a pillow out of felt and carefully machine-stitched his first initial onto it; our youngest maker, meanwhile, was happy making glue designs on a piece of felt and learning how to operate scissors. Our third week was circuit week! 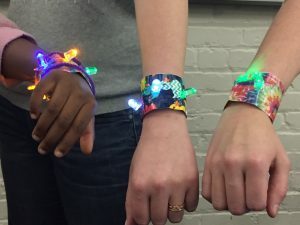 We had a variety of crafts that all centered around using a battery to light up an LED, including light-up duct-tape bracelets; light-up cards; and squishy circuits. With the younger age range, we again found the more-is-better attitude – one maker tried to cram 10-15 LED lights into one bracelet. We also found that the bracelets were an incredibly popular activity. Something wearable that the kids could take home and show off was a real draw. 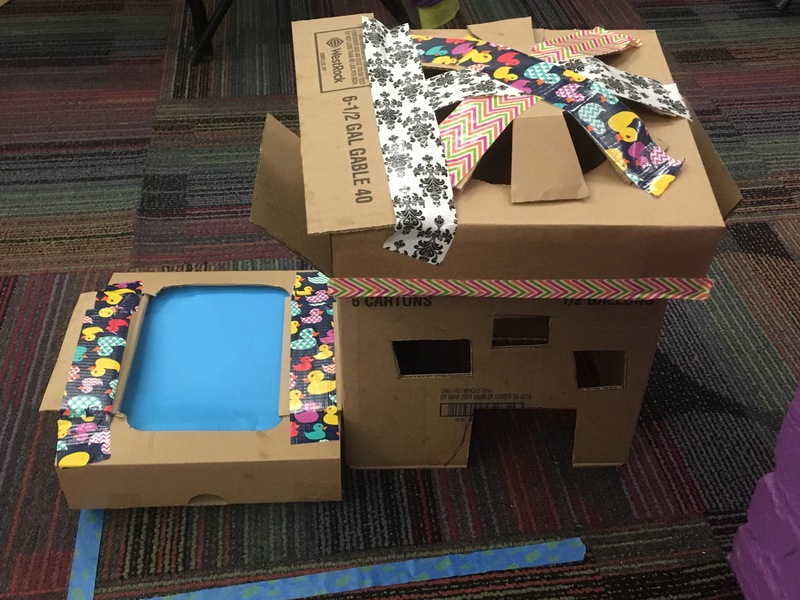 During Construction and Building Challenges week, we brought in cardboard boxes, hot glue, plastic wrap, tin foil, decorative paper, scissors, and tape – so much tape. We laid down a street and lots on the floor with masking tape and instructed kids to build a neighborhood. We did not give instruction beyond that–we wanted to see what the kids thought their neighborhood needed. Boy, did we learn a lot about what the average neighborhood needs! One helipad, one rocket launcher, one soccer pitch, and one house with a pool out back and a diving board on the roof. Meanwhile, another maker took it on himself to make a lifesize car instead of a building, which we loved. Children also started constructing with materials that we hadn’t even brought, like foam blocks that were already in the room. We noticed that children had a hard time focusing their attention for an hour and a half on one project–next time, we’d have them rotate halfway through. Below are two children who decided to take a break and learn how to screw MakeDo screws into cardboard instead. Happy Valentine’s Day! During this week, we brought back the cards that we’d made during the circuit week, thinking that a light-up card would make a great Valentine’s Day gift. Also on the table was glass decorating and button making. The button maker was a runaway favorite – once again, we found that children really liked getting to make something, wear it, and take it away to show their loved ones. This was also a tool that makers could operate by themselves, with a little training–they had a sense of ownership toward their projects after choosing the image and creating the button all by themselves. 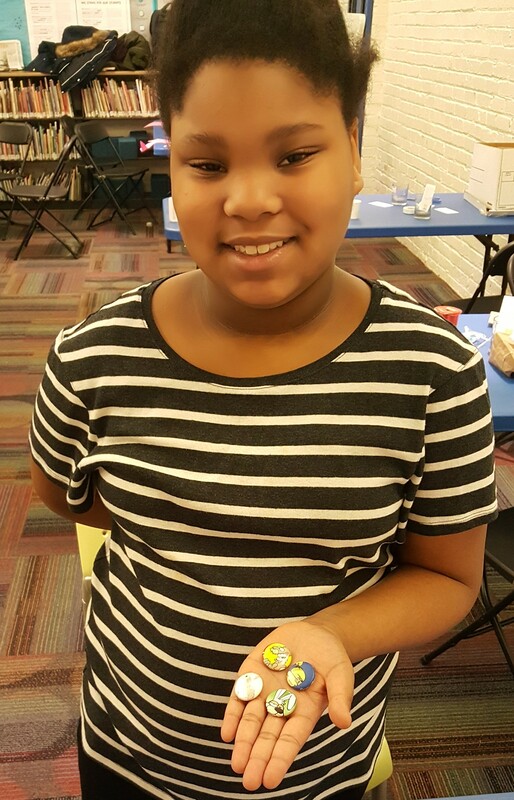 On this day, we brought four different kinds of ‘robots’ to the library–OzoBot, MeeperBot, Dash, and some homemade robots that we made with motors, batteries, and 3D-printed stingrays. 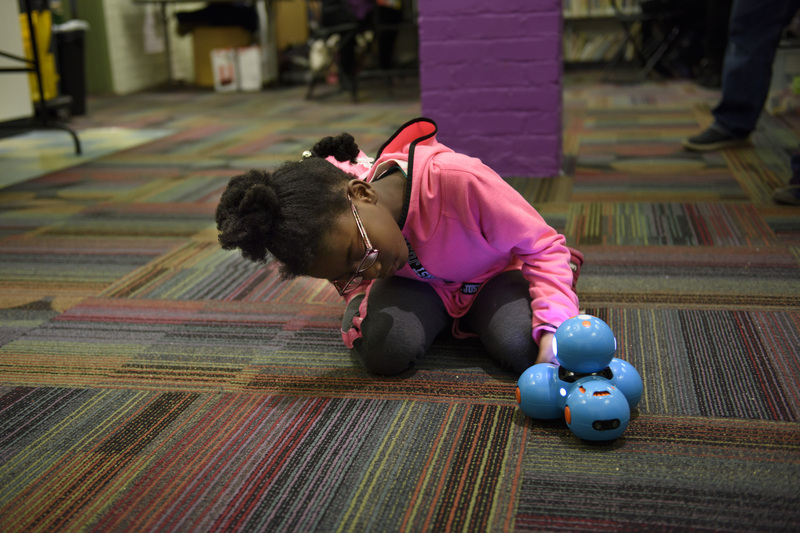 We were once again surprised with how inventive the kids were–the motors that we had intended to power our stingray robots were quickly co-opted to power LEGO cars. We had originally brought the LEGOs for the MeeperBots, but hey–we weren’t going to get in the way of invention as it happened! The photo below was taken by Jeffrey Smith, a photographer at the U-M School of Information. The most recent activity we did, right before U-M’s spring break, was called “Surprise!” on the calendar. 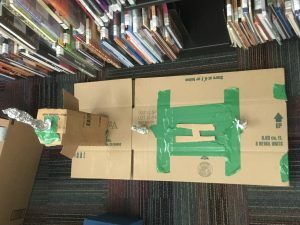 We decided to bring back a few favorites – the homemade robots and the buttonmaker – as well as something new – marshmallow catapults made out of popsicle sticks, spoons, binder clips, and rubber bands. 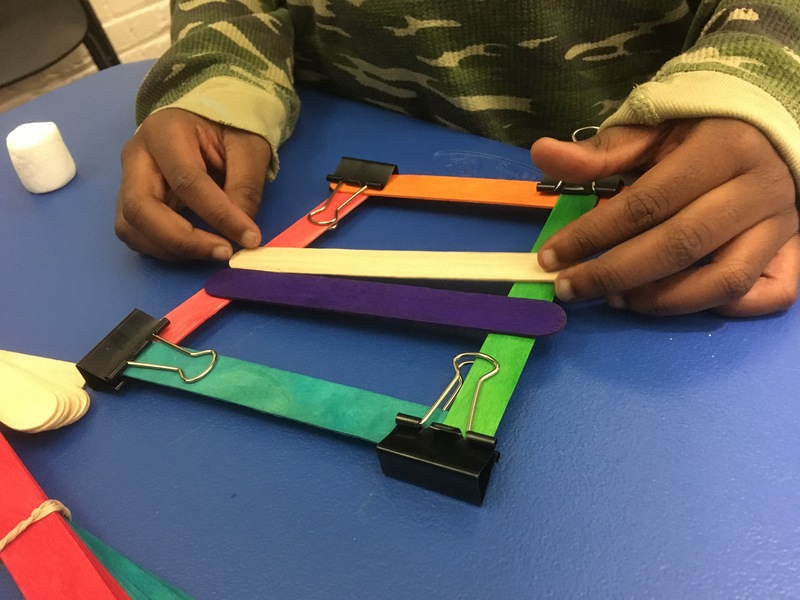 While we made a few example marshmallow catapults, we encouraged children to make their own designs, and were excited to see what they came up with! 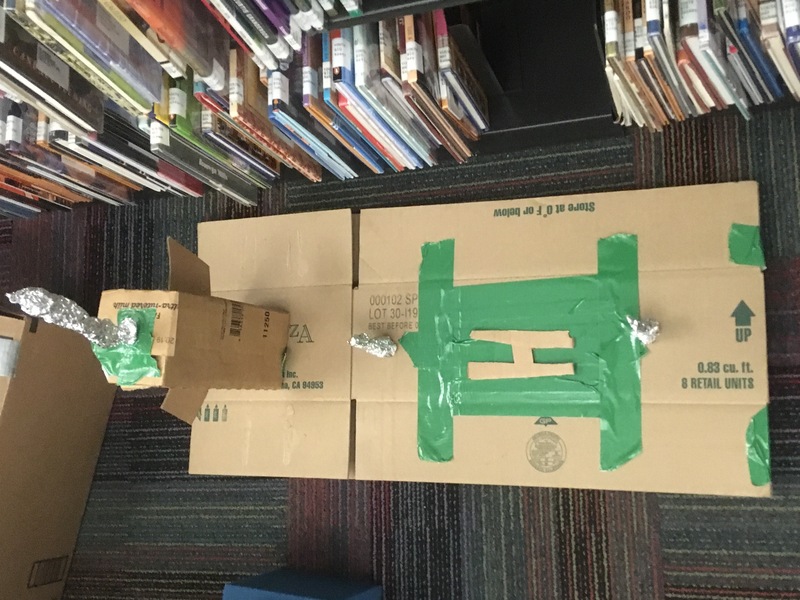 We also offered prizes for the marshmallow catapult, and noticed that children were incorporating the prizes into their projects in amazing ways. One girl made a massage headband by attaching a motor from our robots to a headband she’d chosen from the prize bag. 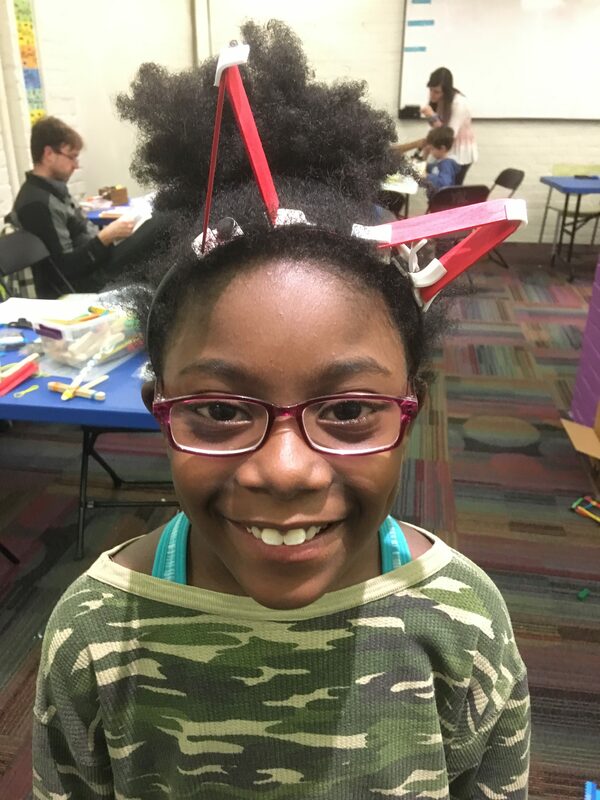 She then used some popsicle sticks from the marshmallow catapults to add cat ears. That’s the rundown from the first half of the semester! Check back to see what else we have in store!